THE Beenleigh Vinnies team is gearing up to provide ongoing support to families hit hard by flooding. As the brown tide of floodwaters subsides across south-east Queensland, the clean-up is proving a mammoth task, not just for an army of volunteers, but also for agencies such as Vinnies which stands ready to help with food, clothing and furniture. The St Vincent de Paul Society’s Beenleigh president John Maksimas said his team was first called in to assist families evacuated by rising waters, who took refuge at the local PCYC. “They needed toiletries, toothpaste, soap, hand sanitiser. So we got the stock and dropped it in,” Mr Maksimas said. He said anyone who needed food or clothing should call for help. 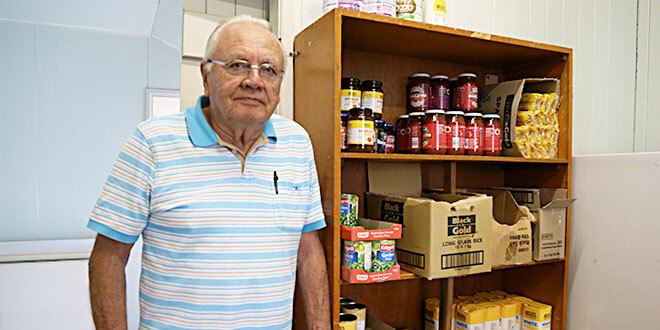 Meanwhile, Vinnies says financial donations are the best way to make sure its teams across Queensland can quickly provide assistance to those who need it. “We need your help so we can be there for people impacted by this natural disaster,” St Vincent de Paul Society Queensland acting state president Robert Leach said. In the wake of Cyclone Debbie, Mr Leach said “every dollar donated goes directly to Queenslanders in need”. Vinnies received a State Government kick-start of $250,000 towards its Cyclone Debbie Recovery Appeal. “These funds and your donations can help us provide blankets and clothing, household necessities, emergency accommodation, financial assistance and more for people who need to rebuild their lives when the crisis is over,” Mr Leach said. “St Vincent de Paul Society has a strong local presence throughout Queensland, providing a hand up to people in need throughout the year. “We have over 300 volunteers and members in affected areas and surrounds, and they are absolutely committed to doing all they possibly can to assist. To make a donation, visit vinnies.org.au/donate, call (07) 3010 1002 or send your donation to PO Box 3351 South Brisbane, QLD 4101. Anyone needing assistance can phone 1300 NEED HELP (1300 633 343). Vinnies members and volunteers will respond to all requests for assistance on a case-by-case basis.